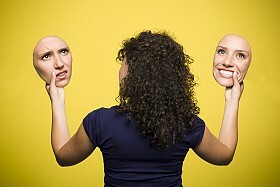 Interpreters live with a constant internal struggle between intent and impact, perception and reality, Jekyll and Hyde. Aaron Brace confronts some of these pitfalls and realizations while taking stock of interpreters’ relationships to whom we serve. Before I can even consider being an ally to Deaf people in the face of societal audism, as a sign language interpreter I must address another overlooked and, at times, more pernicious enemy—the sign language interpreting profession itself. Enemy is, perhaps, too strong a word for the darker side of my role in Deaf people’s lives, but as it stands in counterpoint to the term ally, I find it opens a useful a window into the duality of my role. I’d like to share some traces of this shadowy figure that I’ve spotted in the mirror over the last thirty years in both my interpreting process and my doing business as an interpreter. I learned to manage parts of this enemy long ago, while in other ways he will always challenge me. Inspiring trust and delight in my customers happens, rather paradoxically, more easily when they feel I understand that there’s no real reason they should trust me, and that the reason for my presence, at all, is something less than delightful. They need me to be aware that I come with potentially harmful side effects. Tends to Monopolize Deaf People’s Time, Attention, and Space. I’ve come to understand that my habit of making a bee-line to a Deaf person’s cubicle and cheerily plopping myself down in the guest chair to start establishing our working relationship is often, well … annoying. The first time I took it upon myself to acknowledge he might be busy and offered to wait elsewhere, the Deaf person’s sense of surprise and relief was palpable. This has led me to look for other instances where my presence or my good intentions get in my customers’ way and can be managed less obtrusively. This tendency also manifests itself in how I approach prep. My insistence on time to prepare with a speaker may prioritize my need for confidence in the quality of my product over the speaker’s need for confidence in hers. Insistence on advance prep can also have the effect of implying either that I’m not confident in my comprehension of the source language or that I suspect that the speaker won’t express herself well. Also, I may over-estimate how much my product improves as a result of the preparation I demand. Overestimates His Centrality to the Relationships Between Deaf and Hearing People. On some level I truly want to believe in this. If I don’t, how do I have the nerve to interpret at all? But my customers are not well served by a quasi-messianic philosophy that valorizes my role far above theirs. It’s also simply inaccurate; customers often communicate effectively despite my excellent service rather than because of it. They also, due to forces beyond the reach of my service, can end up not communicating effectively. Is a Fundamentalist in His Adherence to Interpreting Models. I am tempted to embrace new wisdom on effective practice in a way that stigmatizes older wisdom as outdated and oppressive. I believe that fully empowered customers may still request that I perform more like what we’d call a machine or a conduit. Even as I understand that some customers express such a preference because that’s all they think sign language interpreters can do, or they think they’re doing me a favor in making my job “easier.” My Mr. Hyde and I go ’round and ’round over whether it’s more oppressive to comply with requests that might stem from internalized oppression or an incomplete understanding of one’s options, or to presume that it’s even my place to try to “diagnose” such things. Is Wired to Privilege Auditory Input Over Visual Input. I realized at one point that my default strategy for managing turn-taking was to always finish what the hearing person said before attempting to get the floor for the Deaf person. On one hand, it merely revealed my auditory bias. On the other, it perpetuated the notion that the hearing person was the holder of knowledge, and the Deaf person was the needy receptacle. Once I realized this input bias and its implication, I over-compensated by stridently talking over hearing people the second a Deaf person raised her hands. While I’ve since greatly improved the equitability of my turn-taking management, I’ve only very recently learned that I maintain eye-contact in a way that doesn’t accurately convey the availability of the floor in ASL-discourse, depriving Deaf people of cues that would help them manage graciously taking the floor for themselves. The upshot: The choices I make in the name of effective practice almost always come with potentially dangerous side-effects that I must predict and be prepared to mitigate. Expects His Degree and Professional Credential to Command Respect. I wonder if it was necessary, in order to put forth the immense effort needed to earn a degree and professional certification, to believe that these things say more about my ability than they really do. Hearing people, including my family members and the people who are usually responsible for hiring me, typically consider me an expert because I have a degree and a certification after my name. It’s tempting for me to do the same. It’s tempting to resent having to prove myself anew to each customer and each colleague I meet. It’s tempting to feel betrayed by the institutions that authorized my entry to practice, knowing that savvy customers consider me competent in spite of my paper qualifications, not because of them. Is Rigid About Best Practices and Industry Standards. There’s a fine line between what I need in order to do my work well and what I want in order to make it easier. I often lose sight of that line. I insist on industry standards like going rates, cancellation policies, two-hour minimums, and best practices like requiring a teammate and prep materials as if these were all cast in stone, even at times when there might be a good reason to waive or modify them. I also don’t want to legitimize disreputable agencies that don’t follow standards, even when this may cause customers whose are stuck with those agencies to suffer. This is another issue on which this Mr. Hyde like character and I go ’round and ’round. Maintains Faulty Expectations of a Profession, a Career and a Business. I was raised to expect that a profession would provide all of my material comfort, and that at some point I would cease having to defend or prove my expertise. I expected I could pursue a career ladder in my own best interests, and that there would always be a higher rung to reach for. I expected that as a businessman I would be expected to prioritize maximizing profit, at least slightly, ahead of all other considerations. These unexamined expectations clash with my reality even during flush times, but significantly more so in the current economic climate, with an ever-expanding roster of gatekeepers to the work. The situation has become dire for some colleagues, and the volume of my work is trending in same direction. What happens when my profession can no longer provide the same income? How do I continue to provide customer-centered service while dealing with the financial hardship, the blow to my professional ego, and the feeling of betrayal by my industry? I think that understanding and seriously altering my expectations, learning to live with less to the extent that I can, is the best thing I can do to avoid having to make choices out of desperation while I work with my community to make things better. I also wonder whether it’s viable to continue bringing new practitioners into the field, or into specific markets, expecting that we will all continue to be able to support ourselves solely as sign language interpreters. The upshot: A schema roughly bounded by concepts like profession, career, and business fosters expectations of the rewards for my work- expectations of which I’m mostly unaware, yet which can thwart the interests of my customers. One last observation about this enemy in the mirror: he resists thinking about issues like these because he thinks they entail a life of constant apology. I’m not sure I’ll ever fully understand my duality as both ally and enemy in the lives of Deaf people without some measure of guilt. Like many members of privileged groups, I hope to learn the right way to behave toward an oppressed group—once— and never again have to feel unsure of myself or guilty about my privilege. I seek constant validation as “one of the good ones.” I believe this takes a psychic toll on Deaf people, though—even those who know me well and truly value what I have to offer—when I deny there’s a shadow cast by even my worthiest efforts. I can only hope to be an effective ally against an enemy opposing Deaf people’s interests when I understand how “he is us,” and in some ways always will be. When I demonstrate a fuller understanding of both what I give and what I take, it is returned by Deaf people, not with a sneering pleasure at my knowing my place, but with greater trust, friendship, and welcome.